Kohlrabi is probably one of the most misunderstood vegetables you’ll find in the supermarket. Most people don’t have a clue about what to do with them. 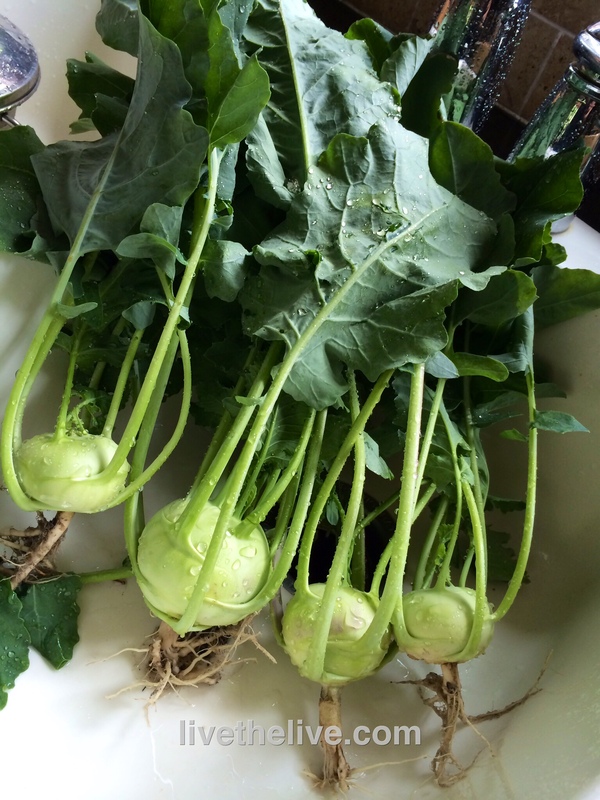 Kohlrabi is a member of the cabbage family and can be eaten raw as well as cooked. For me, the real joy of kohlrabi is biting into a crunchy, sweet, freshly picked and peeled bulb right out of the garden. Unfortunately, much of the kohlrabi you find in a supermarket is grown larger than a tennis ball, making it tough, woody and dry. And they usually remove all the leaves, which are delicious cooked or raw. Wash the veggies thoroughly before using. Pull the leaves off the kohlrabi bulb, and remove the stems. Grab a bunch of leaves at a time, roll them up tightly, and slice as thinly as you can into thin ribbons. Place in a bowl. Do this with all the leaves. Peel the thick skin off the kohlrabi bulb and slice it as thinly as you can. Then take the slices and cut thin sticks out of them. Toss into the bowl. Season the leaves and bulbs slices with a little salt and pepper, then add Awesomesauce to taste and toss well. Refrigerate covered, and let the flavors blend for a couple of hours before using. I have forgotten to eat kohlrabi many years, even though I like it. Must eat it again. Thanks for reminding me of this healthy vegetable. Cool! Just make sure you get them no larger than a tennis ball.